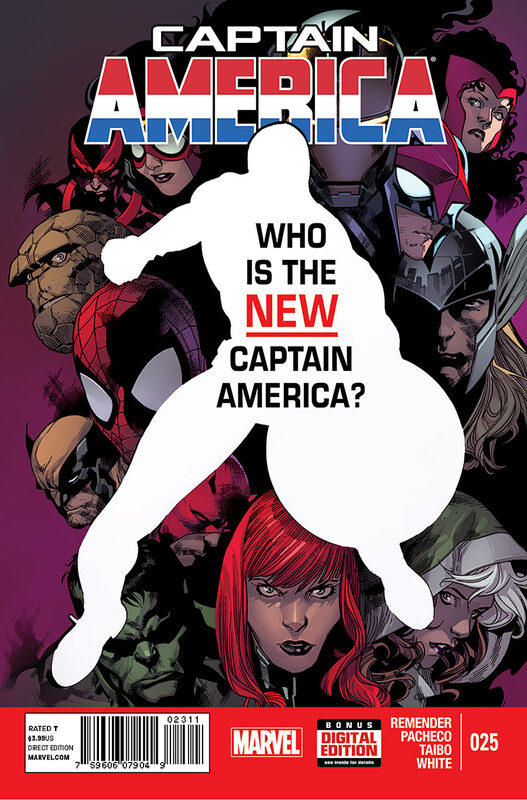 The cover yells, “Who is the NEW Captain America?” But the sad thing is if you picked up Captain America #25 you probably already know. Marvel has already spoiled the most important plot point through press releases and news stories. So I feel a little more free with spoilers in this comics file. Captain America has successfully stopped another attempt to conquer the Earth. In the aftermath of the attack, Captain America loses someone close to him while regaining others. What is clear to Steve Rodgers is that he can no longer carry the mantle of Captain America at his now unsupercharged advanced age (yeah made that word up). At the biggest Avengers house party ever, Steve Rodgers introduces his new role, to lead from behind. And he debuts the new Captain America, a hero that Marvel Cinematic Universe fans are very familiar with. In the Epilogue, the Unknown Council gathers to discuss the new Captain America. Among the members of the Unknown Council is an Avenger, whom appears to be prepared to betray his heroic teammates. “Once an Avenger, always an Avenger,” declares Captain America. Sure most men his age and physical condition would consider retirement. But not Steve Rogers! He not only plans to retain his Avengers’ membership but he will continue leading the super-team. And no one is questioning this fact. Rogers still leads even if from behind. And now he protects his team in an entirely new way, with his trusty much younger girlfriend at his side. Maybe being good all those years did pay off! Hawkeye steals the show. Sure Rogers has gone through a lot of tragedy lately. And yes his body is now properly aged. But Hawkeye does not lay off mocking Steve Rogers at all. I honestly liked it. If anything it showed Barton sees Rogers as his friend and understands he is transitioning. But he does not take pity him, he treats Rogers like he always has. It is a true sign of respect and ignores the fact that Rogers is now a senior citizen. And that could help heal them all. I am missing somebody. I know for a fact I have not captured every Avenger in attendance. Literally every Avenger shows up to the party, leading Sunfire to note that he is not sure who everyone is. It is epic, and it shows the respect that Captain America has amongst the Avengers. Could anyone else have gotten this guest list to show up to the mansion? If there is one twist that I do not like it is the next step in Jet Black’s story. It seems a little soap operaish to me, and not the direction I wanted Rick Remender to go with his character. I just hope we get to see more of her soon and this is not the final word in her tale. Who is the Avenger’s traitor? No one but Rick Remender knows! Okay, he may have told some folks. The fun part is I have already started making guesses with the few clues that we have so far. Hey, they were at the house party, but who wasn’t (well Agents Coulson and Fury were not there so we are safe there…and the traitor is not Deadpool either). I read things out of order so I am a little lost. I went straight from Captain America: Iron Nail to this issue. There is a three-issue gap however between installments, with the missing issues discussing the invasion that Cap fights off. So I was a little disorientated in this read, but I adjusted and caught up thanks to context clues. Hey look at that, I made it the whole file without specifically saying who Captain America was! I wonder if it is even possible to keep a secret like this anymore in a world with solicitations coming out two months before an issue hits the shelves. Marvel gets to sell not one but now two books with Captain America for future releases. I just really wish we could figure out a strategy to keep the big reveals secret until we turn to the pivotal and awesome splash page. Can we just have a secret kept now and then (nobody tell me the spoilers of Episode VII or I will lose it).